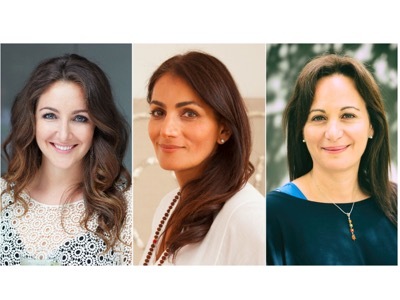 Join The Women’s Chapter and Telegraph Women for an inspirational evening highlighting the journeys of three women innovators in the spheres of holistic skincare, healthy eating and wellness travel. Anita Kaushal, co-founder of Mauli Rituals will share her story of how a life changing event led her on a pilgrimage to her motherland to rediscover the healing power of India’s traditions and gave her the impetus to start Mauli. Natasha Corrett, founder of Honestly Healthy, will talk about her journey to health through nutrition and how she is now helping small business owners who share the same healthy ethos; while wellness travel pioneer and founder of Wellbeing Escapes, Stella Photi will expand on how she saw an opportunity to fill a void in the travel and wellness market. The seated panel discussion and Q&A will be hosted by Telegraph Women editor Claire Cohen in the private event space at Space NK on Hans Crescent in Knightsbridge. Following the discussion, there will be plenty of time for bubbles, networking and complimentary Mauli Rituals hand treatments as well as an opportunity to purchase signed copies of Natasha Corrett’s new book Honest Healthy in a Hurry. This glamorous, inspiring evening will be an opportunity to engage with women at the forefront of wellness, network with fellow professionals and entrepreneurs, and be inspired. Space NK will be providing some very special goody bags, so all in all, it’s an evening not to be missed! Anita Kaushal is the co-founder of Mauli Rituals; a British brand of luxe skin and bodycare products, inspired by her Indian, Ayurvedic heritage. Born and raised in West London, Anita grew up surrounded by the intricate fabrics and artefacts her father imported from Rajasthan. After a successful career in sales for a perfume brand, Anita decided to follow her passion and founded a multi-channel retail of handmade lifestyle products made by local artisans and internationally acclaimed designers. Her mix of old, new, ancient and modern also applied to her writing and art-directing style, as in motherhood, she went on to conceive best selling books for Thames & Hudson and then launch her Creative Consultancy. A devastating and life-changing incident in 2012 gave Anita the impetus to launch a fund-raising initiative £1m for charities that support women and children. This took her career full circle with the launch of Mauli. The common thread in all her projects has been to share products and ideas that make life more beautiful on both a physical and emotional level. Mauli launched in late 2014 and is available through some of the world’s premier retailers including Space NK, Net-A-Porter, Liberty, The Conran Store and London’s Bulgari Spa. Natasha Corrett is one of the UK’s top vegetarian chefs. She founded Honestly Healthy on the back of her own struggles with yo-yo diets, up and down weight gain and digestion issues. In 2010 a severe back injury led Natasha to discover the alkaline way of living that has changed her life and motivated her to inspire others. Her new lifestyle approach led Natasha to organise health and wellness retreats. When one of the chefs didn’t show, Natasha had to cook and feed her guests nutritious meals. Following this retreat Honestly Healthy came to life in 2010 in her own kitchen, where she cooked over 50 alkaline meals a day and personally delivered them to offices and homes around London. As the company grew organically and through word of mouth, she was invited to present her food to Selfridges to launch the brand. Thousands have now followed her lead, including celebrity fans Victoria Beckham, Robbie Williams, Lily Allen, Fearne Cotton, Millie Mackintosh and Jessie Ware. Natasha has authored three best selling cookbooks in the last 4 years, launching her fourth book in May 2016 titled Honestly Healthy in a Hurry. Most recently, in true entrepreneur style, Natasha has launched the Honestly Healthy Market Place to help support small business owners who share the same ethos at Honestly Healthy. Stella Photi combined her passion for preventative health with her extensive travel industry experience to create Wellbeing Escapes in 2005. Through this pioneering move in the wellness space, Stella has inspired thousands of people to take a different type of holiday and has helped position wellness tourism as a serious segment in the mainstream travel market. Stella has visited over 54 different countries and has tried hundreds of different treatments. As a wellness travel authority, Stella has lent her expertise to many different media publications and is a regular contributor to the Huffington Post lifestyle pages. Prior to starting Wellbeing Escapes, Stella managed Leisure Sales for a major US airline in Europe. She and her business partner left their jobs in 2001. This gave Stella the opportunity to fill a void in the travel and wellness market and to extensively research her dream to create a company that focused on people like her. Stella sees wellness as a journey that doesn’t have an end, but you need like-minded people to guide you. Wellbeing Escapes recently won ‘Best Specialist Tour Operator’ at The Telegraph Travel Awards 2016. Special thanks to Space NK for hosting this special event.